Detail from the cover of Xombi #6 from the 2011 series. In the mid-1990s, David Kim lived in a world where bicycle piranha would secretly feast on chained-up two-wheelers. He fought against incarnations of misdirected rage and rode in elevators where you had to read stories aloud to get to the right floor. He was the main character of Xombi, a comic about an unkillable man, an experiment that died too soon. Twice. David Kim wakes from a near-death state to realize the horrific reason he’s still alive. Xombi’s first life began as a character concept created by Dwayne McDuffie for Milestone Media, the company he co-founded with Derek Dingle, Denys Cowan, Michael Davis, and Christopher Priest. An ongoing series launched in January 1994, written by John Rozum and J.J. Birch, released by DC Comics through a deal Milestone had with the publisher. Over the course of 21 issues, Rozum, Birch and their co-creators delivered one of the best occult universes ever seen in mainstream superhero comics. How David Kim got superpowers follows the mournful tradition of classic superhero origin stories but injects a shockingly intimate level of horror for even more tragedy. Wounded and near death after an attempted theft of nanotechnology he invented, David has his assistant and former student Kelly inject him with nanites that can transform any matter into living tissue. The nanites need raw material to reshape and David wakes up to find that the tiny machines used Kelly’s own still-living body to heal him. Grotesque assassin Manuel Dexterity goes on a psychic killing spree. Racked by guilt and unable to die, David soon finds himself coming into conflict with malevolent forces from dark corners of secret realities. The world-building is where Xombi really shines, as Rozum populated the book with appealing bizarre concepts and personas. Take Manuel Dexterity, the half-man, half-giant-hand assassin David fights in the School of Anguish story arc. His visual is designed to make you think he’s a bruiser but his true threat is an emotional one. Nun of the Above drops a nasty dunk in a pick-up basketball game. He kills people by ramping up the pain of unfulfilled desires to lethal levels. David’s ally, Nun of the Above—who could fly and “look” at people with near-omniscience—is the exemplar of Rozum’s approach: ideas that probably started with dad-joke pun-names, then were shot through with primal psychological conceits to make you giggle and recoil at the same time. Catholic Girl, Nun of the Above’s junior partner in supernatural investigation, activates her force field by praying. 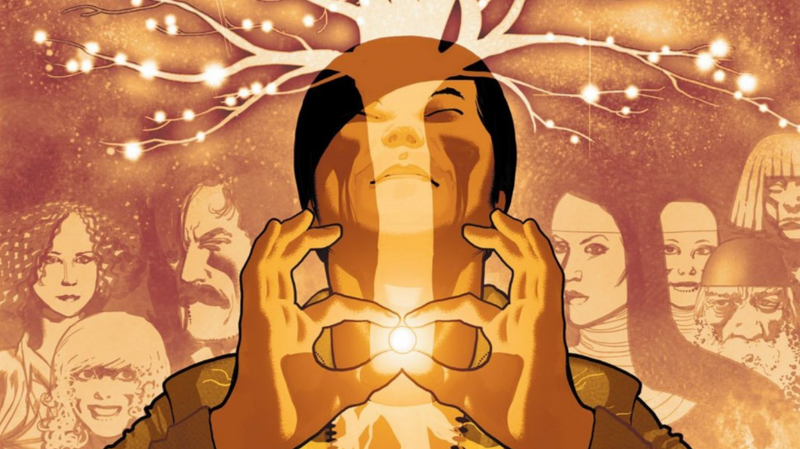 Back in the day, the bizarre characters and focus on the occult gave rise to the running joke that Xombi was the Milestone series that should’ve been a Vertigo book. But, as the furthermost outlier in a universe made up of characters from marginalized groups, Xombi exemplified the “diversity within diversity” philosophy of the Milestone Media offerings. The real and bizarre worlds wove into each other in Xombi, resulting in a cornucopia of beautiful, everyday weirdness in each issue. After learning he belongs to the rare class of unkillable humans called Xombi, David’s defining dilemma was trying to figure out which world he belonged to. Birch drew every single issue of the original Xombi series, in a style that felt sensuously chaotic and appealingly cartoonish. The rush of ideas only increased as it went on and Xombi became one of the era’s best-kept-secret titles, which made its cancellation a shock. David Kim thinks about the long, strange trip he’s been on since becoming a Xombi. A happier shock came in 2011 when Xombi returned in a new series by Rozum and artist Frazier Irving. One of the best things that Rozum does in the two volumes of Xombi is to puckishly hyper-compress the passage of time. The original Xombi ran from January 1994 to December 1995 but David’s adventures take place in the span of only a few weeks. When the more recent Xombi comics came out almost 20 years later, David says that he’s been unkillable for two months. What’s more, where the original series had characters using pay phones on the street, cell phones had become ubiquitous by 2012 and were used in at least one instance in Xombi volume 2. To me, the two months/two decades thing isn’t a plot hole or continuity error. Rather, in a book like Xombi, this creative choice underlines the strange nature of the fictional landscape Rozum created. Time does and doesn’t pass. Things exist that resist explanation and we have to co-exist with them. That dissonance is the core of David Kim’s struggle in Xombi. David talks with another immortal and debates whether to tell his fiancee about what he’s become. This series only lasted six issues but Irving created incredibly memorable imagery in that time. The polar opposite of Birch’s frenetic style, Irving’s art comes across as creamy and waxy, as if the new Xombi were happening in an impossibly smooth dreamscape. Rozum and his collaborators created a heady experience that balanced palpable horror and philosophical depth with humor and yearning. Xombi wandered into religious and folkloric frameworks and to read it is to realize that mundanity and fantasy are separated by a very thin membrane. Xombi is one of the best examples of how far comics can take a reader. If we’re lucky, John Rozum will eventually get the chance to tell more stories like it some time soon.